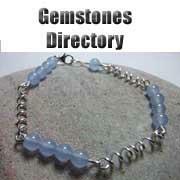 Which of the following gemstones is purple? 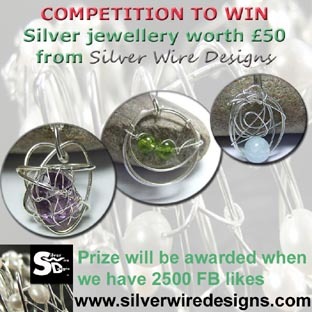 Competition Terms and Conditions - Entry open to all persons 18 years and over except employees of Silver Wire Designs and their family. No purchase necessary. Only one entry per email address. All entries must be sent by email including the details required and with the word competition in the subject field of the email. 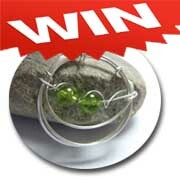 The winner will be selected at random from eligible entries when the facebook page has acquired 2500 likes. The winner will be notified by email. If the winner fails to respond to emails or to provide an address to send the prize to within 1 calendar month the next eligible entrant will be offered the prize. The prize consists of a piece of jewellery up to the value of £50 chosen from this website and subject to availablilty.The item will be posted free worldwide. The winner may be included in publicity material, and by entering into this competition, entrants agree to their name being used by us for publicity purposes in the event that they win. If a more expensive piece is preferred the entrant may choose to pay the difference. The prize is non transferrable and no cash alternative is available. Liking us on our facebook page or joining our facebook group is not a requirement for entry into this competition. The data will be collected for the purpose of this promotion and by entering this competition entrants agree to be sent occasional newsletters and offers including details of further competitions. If entrants would prefer to opt out of receiving such offers they may do so at any time. We are committed to protecting your privacy and will not sell your personal details to any third party. The winner of the last competition which ended 31 Dec 2012 was Lisa Wilkinson from Hull who chose a Cherry Quartz Pendant for her prize.